​I have to say, the Jugged Hare is horrifyingly fascinating to me for some reason. It's a little like a train wreck; I just can't look away. I also enjoy the cook, who is incredibly funny. And, of course, Giles and Sue are absolutely hilarious. ​"It's good, because you get sweetness, and then suddenly you get salty cow." I love how they intersperse this with historical tidbits. It makes for an all-around enjoyable bit of research for anyone interested in the English Regency. What did you find to be the most interesting aspect of this video? For today's Regency Wednesday post, I've decided to re-post one I did on my old blog. The original post was from October 5, 2011. One very famous Regency figure was George Bryan Brummell, more commonly known as Beau Brummell. He set the trends for fashion and cleanliness of person. His acerbic wit was both loved and feared by his contemporaries. In the early years of the century, he was never far from the Prince of Wales's side. At the start of the Regency in 1811, the newly appointed Prince Regent started distancing himself from some of his friends, Brummell included. Towards the end of the Regency, as his debts piled up until he couldn't afford to pay them, Brummell lost favor with the Regent and fled to the continent in 1816 to escape debtor's prison. He died in Caen, France in 1840, insane and poor. Thank you so much for stopping by! 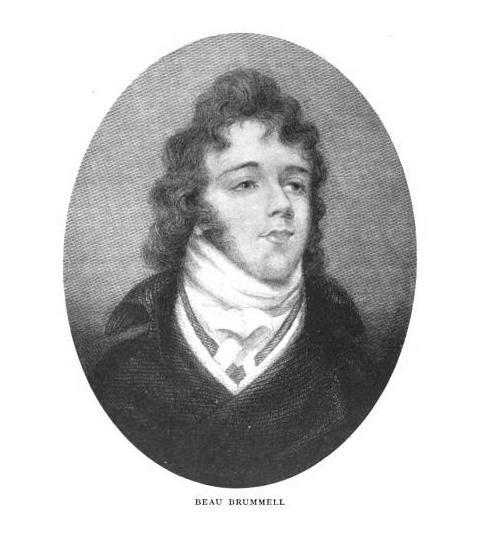 To read more about Brummell, check out the Wikipedia article HERE. "The accompanying view exhibits a representation of the north end of the street called Old Bailey; the Sessions-House being on the right; Newgate in the centre; and part of St. Sepulchre's church on the left. It goes on for a few pages after that, explaining the history of the Sessions House and then going into some detail about Newgate Prison. And as is the case with many historical writings (and modern, lol), the author puts a bit of his own opinion into it. All in all, interesting reading. Thanx for stopping by! Have a lovely week! *Taken verbatim from Ackermann's Repository, June 1814, p. 345. Get the Google e-book HERE.